Introducing a uniquely flavoured and trending middle bacon. The tail is folded up to form a wider middle slice. Unlike any other middle bacon in the market. 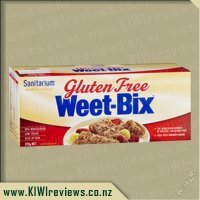 NZ Free Farmed Pork (84%), Water, Salt, Natural Flavour, Sugar, Dried Vinegar, Dextrose (Maize), Yeast Extract, Citrus Extract, Potato Starch, Maple Flavour. NOTE: May contain traces of Soy. No added Nitrites. 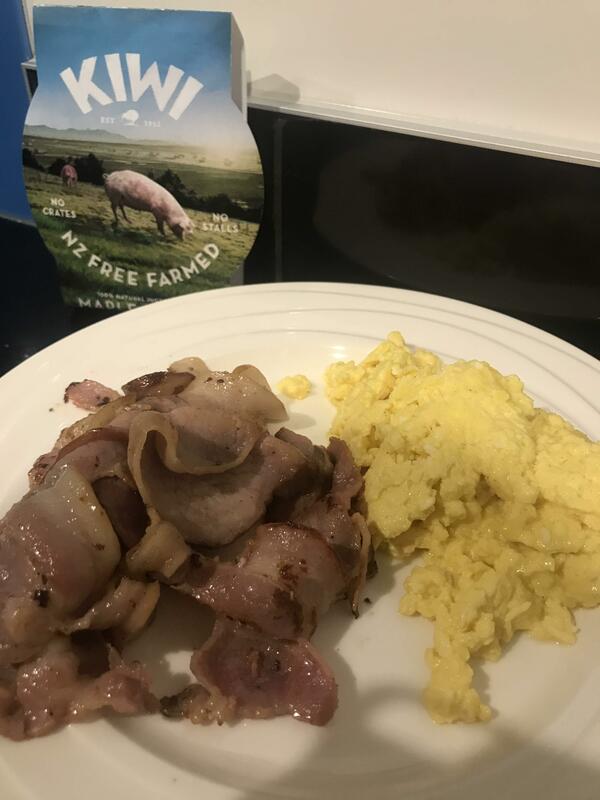 This was a lovely change for me, I have been a streaky bacon buyer for such a long time, I had almost forgotten that you can get different types of bacon. 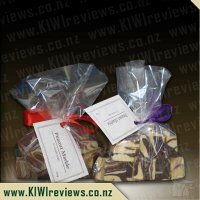 Within the packet there was plenty of bacon for a meal and it was a bit of a quandary, as to what to make with this delectable treat. I was leaning towards a bacon butty sandwich, but I knew it wouldn&apos;t do this justice! A decision was made to make paninis and use another review product I had on hand, and we stuffed the paninis with bacon, spinach, cheese, tomato and pesto. The bacon had been pan fried, and then we toasted the paninis. The smell was divine, it wafted through the house and made our taste buds tingle, we were all ready for our dinner when it was served up. The first bite had such flavour to it, I forgot it was a middle bacon, the maple, bacon taste was all encompassing and delicious. The bacon wasn&apos;t chewy, and it had a great texture, although this would vary I imagine with the cooking method undertaken. I think this bacon was a great buy, at $8 it was a good quality bacon with a fantastic flavour, the maple really complimented the bacon. 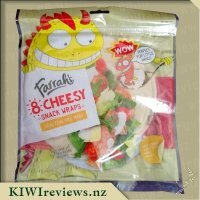 These days for me flavour is not always the main factor in my purchasing so I read the packaging and found that this was free farmed pork, and Kiwi bacon have made it clear these are paddock raised pigs with no crates and no stalls, which is a huge positive for me. 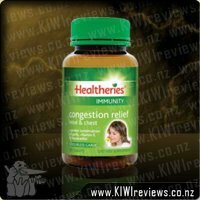 I&apos;m also a fan of buying New Zealand made products, and this is a homegrown product. 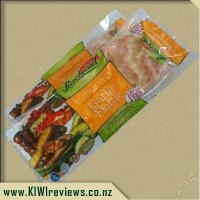 I will be buying this again, as its perfect for in burgers, paninis, chicken and bacon salads, as it&apos;s more cost effective than streaky bacon, and full of flavour. I don&apos;t usually buy middle bacon because it can be dry, and some brands just don&apos;t deliver on the flavour. But this variety ticked both boxes. I took it to the beach with me so I could share it with my cousins, but they were away for the evening so I shared it with two of our bottomless teenagers instead. That was a good choice; they are both addicted to meat, being fast growing young men, and were extremely willing to help me test it! I had some cold chicken and there were prunes and mushrooms in the fridge, so I made my own version of devils on horseback. We cut each rasher in two and prunes, mushrooms, chicken pieces, and a little hot sauce were added before we rolled up the bacon around it. These were then cooked in the oven at a moderate temperature until the bacon was nice and crisp. The smell was overwhelming and I had to stop both boys from raiding the dish before the cooking was completed! I served the bacon roll-ups with fresh tomatoes (because they were far too nice to ruin by cooking) and mashed potato, and did try to hide the tomato sauce but I was too late! Both boys were enthusiastic and would have eaten more if there had been any leftovers. Mr 16 made do with having seconds of tomato, mashed potato and sauce! Mr 14 decided he had eaten enough although he would have come back for more if there had been any. 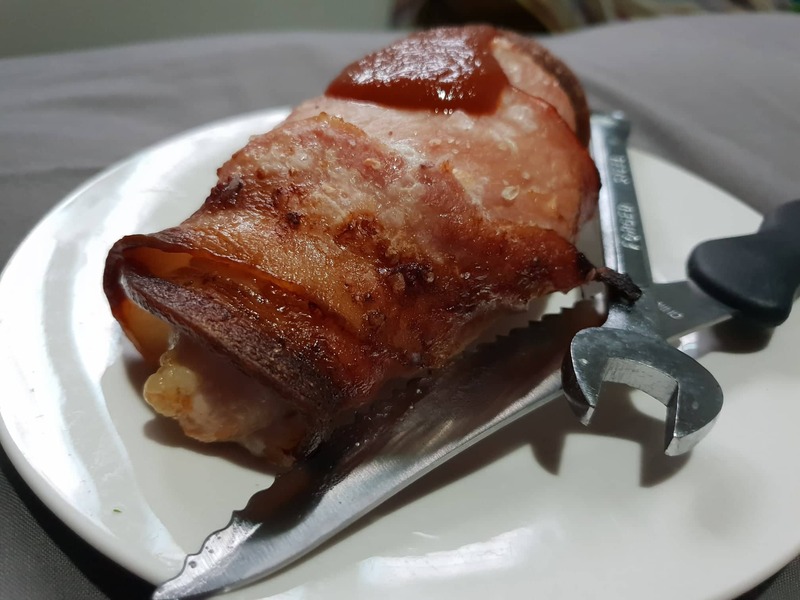 As for me, I was delighted with the result - the bacon has a wonderful spicy sweet flavour which was not lessened by the combination with other ingredients. The chicken, mushroom and prunes, if anything, enhanced the bacon flavour. The boys would like me to cook it again for them, and I would be very happy to do so. There was one rasher left uncooked, so I had it myself next day with the conventional addition of scrambled egg on toasted rye bread. Although this may not seem very adventurous, I did want to see how it would compare with other breakfast bacon slices. It was good to see that there was almost no fat generated; I grilled it while I was preparing the egg and toast, and the drip tray was still clean when I slid it on to the plate. The taste was even better than it had been the first time round; I like the smoky maple aftertaste and also appreciate the fact that it does not contain nitrites as this means the meat is preserved naturally. I find the price is reasonable for a product of this quality. In the past I have paid this amount for bacon that is very fatty and contains occasional lumps of gristle or small bones. This bacon is 100% edible and if there did happen to be any left over it would be fine stored chilled to put in sandwiches - there would be no congealed fat to spoil the flavour. My one concern is with the sodium content. 100g contains nearly half the daily recommended amount, and if you happen to be on a low salt diet (as I am) the daily amount is even less. However, as an occasional treat, I would certainly buy it and just be aware that it is important not to over indulge. Having a couple of teenage boys to help out will ensure there is no danger of that. I don&apos;t cook bacon often anymore, whilst it is a flavour that I like and I have a couple of dishes that I simply adore having bacon in, I find myself rather put off by the amount of fat it contains and then I also have to factor in cost because I wouldn&apos;t want just a little bacon, I want tonnes!!! For eight dollars, this is on par with other bacons of similar cuts but just from looking at it, it&apos;s not something I would have usually chosen as it appears to have a tonne of fat, too much for my liking but that&apos;s the beauty of review items. I opened this up and love how easy it was to open it, I didn&apos;t need to use scissors or knives to open it which was a refreashing change from the packets I usually get which end up being a trial to open. I cut off some of the fat and that took away about a third of the meat, I then diced up what was left and it cup up and nice and easily, which is always a positive, makes the task so much easier. I threw some diced onion, celery, onions, carrot and garlic and then threw in the diced up bacon, just to see how it would all cook together as usually I find the bacon has to be cooked seperatly to have it cook well. When it came time to throw in the sauce I found that the bacon had cooked beautifully. Mixed in with the sauce, on top of mashed potato and a sprinkle of cheese on top, you could still taste the maple bacon which had cooked really well. This isn&apos;t my usual fare and price wise not what I&apos;d usually buy but I may well be buying this in the future as it had a lovely taste and cooked really well. Is there any better smell than cooking bacon? I&apos;m inclined to say no! The waft of salty and slightly sweet pork always gets me, and my family, around the table in no time at all. 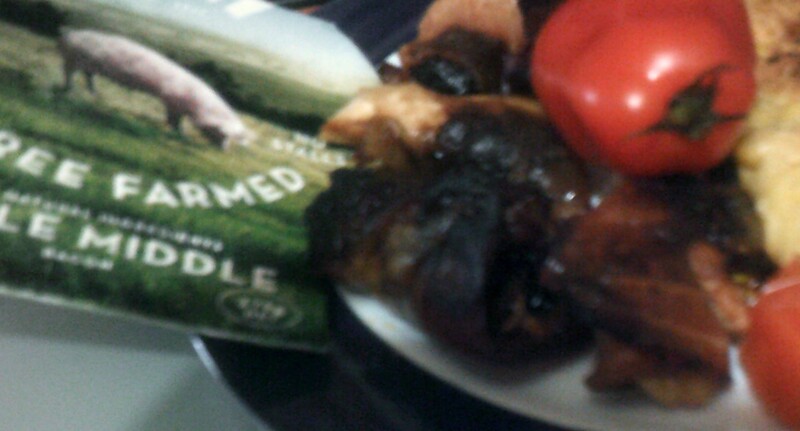 However I am very concious of the way that pork is farmed in New Zealand. With the talk of intensive farming and crates etc, I always try to choose free-range where possible, even if that means having it a little less often. 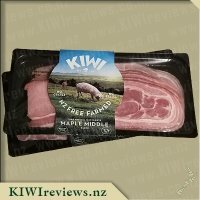 I was so excited to try this Kiwi Maple Middle bacon as we love maple syrup in our house, and I wanted to see just how much the maple would come through. I had also never cooked with the middle cut before, so was interested to see how different it would be. The packet was reassuringly heavy when I first picked it up. Inside were six thick rashers of bacon which looked really meaty (no soggy, wet-looking bacon here). 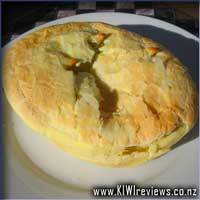 I knew that the first test would be to cook some up and see how they faired. With each sice being folded, there is a surprisingly large amount of meat in each one, and two pieces was enough for three sandwiches. The bacon crisped up really well in the pan (and I didn&apos;t have to use oil, I just dry-fried) and came out with a delicious caramel colour. The smell was also first-rate, a really deep and rich sweetness accompanying the pork, and we all tucked in eagerly to our sandwiches. The taste was everything I had hoped it would be. The pork beautifully accompanied by the tangy but sweet maple, with enough salt to have that umami, lick your fingers delicious, savoury note, but nothing overpoweing the delicious flavour of the pork. 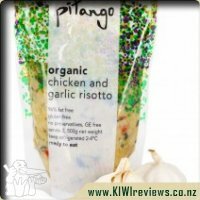 It was obvious the high quality of the product as hardly any water came out in cooking, meaning that all of the weight which you are paying for you are actually eating- which has got to be a good thing. Knowing just how delicious the bacon was, we decided to try it in another couple of ways. We added a cooked and chopped-up rasher to some savoury muffins, we added one chopped up rasher to some home-made burgers and the final rasher we used on a pizza. In all of these cases the bacon held its own without overpowering the dish. The touch of sweetness went well with the pizza (especially the tomato sauce) and the tang complemented the burgers brilliantly. The savoury muffins were packed with flavour, and the kids even forgot that there were veggies in them, which was a huge win for me! Overall I cannot rate this bacon more highly. Whilst it is a little more expensive than some, I truly believe that the better animal welfare, higher quality product and superior taste more than makes up for it. 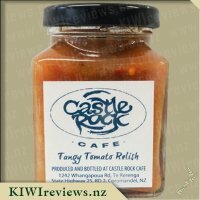 It is such a versatile product and is just as good on its own as it is adding flavour-bursts to any dish it becomes a part of. 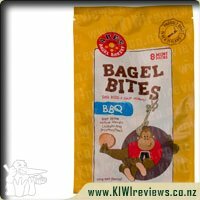 A fantastic product from Kiwi bacon, and I for one will definitely be going back for more. What sane person doesn&apos;t enjoy bacon? Yet interestingly, I&apos;ve not tried all of the different types of bacon. I&apos;ve always been a streaky bacon man. It&apos;s all I&apos;ve ever really known. And even though streaky bacon is certainly temperamental--trying to get that fine balance between soggy bacon and burnt bacon--I&apos;ve never thought to try other types of bacon, let alone flavoured free-farmed bacon. The first thing that I noticed when I opened the pack, was the large ring of fat along the edge. While at first, it seemed like a lot, when I noticed the area of actual meat and the thickness of it, I was more than impressed. The bacon cuts feel at least 50% thicker than the average streaky bacon, and that extra thickness gave it much more durability when it came to cooking. I&apos;m used to my bacon constantly curling up as it cooks, but this middle bacon cut stayed pretty flat as it sat in the cast iron frying pan. This meant I actually ended up slightly overcooking my first couple of pieces. BUT the thickness of the meat meant it was still okay in the middle and hadn&apos;t ruined the product. Even slightly overcooked on the one side, you could taste a subtle sweetness to the meat, and you could really enjoy the textures. I was cooking these cuts in the frying pan as I had a bacon-wrapped chicken in the oven, but the aroma had me feeling enough hunger pains that I had to cook the rest while I waited. There was a bit of inconsistency in the sizes of each cut in the pack, but I&apos;d like to think that is to avoid wastage and the amount of meat is much more significant to that of my usual streaky bacon anyway, so I wasn&apos;t concerned (it would just make it a bit harder if I was sharing the bacon with others). The bacon-wrapped chicken came out superb. Even sitting uncovered in the oven for an extended amount of time, the bacon didn&apos;t burn, and the chicken didn&apos;t try out. Instead, the bacon held those juices in nicely. I&apos;m honestly very impressed with this middle bacon. I love my meat, so to get such a substantial serving that is so much more resilient in preparation, it may be the new go-to for me. Oh, how my family loves bacon, it is one of those ingredients which we always have on hand, and never leave our grocery shop without, WHY? Because we put bacon in everything possible, in pies, quiches, burgers, pasta dishes and in a simple meal of good ol&apos; bacon and eggs, in our eyes theres not much that bacon doesn&apos;t go with, we even put it with waffles and pancakes! Knowing that this bacon was in my fridge and needing to whip up something quick and easy for my partner to take to work for his dinner as he was on night shift I decided to put the bacon to the test and make a bacon and egg pie, using all but 2 rashers of the bacon (the pack contained a total of 6 pieces). I removed the rind as my family tries to avoid eating this part of the meat and using a pair of scissors chopped the bacon into small pieces which I then fried up as I believe doing so adds more flavour to the pie rather than putting it in the egg mixture raw, and on this occasion it was certainly a must as I wanted to try and get the full flavour of the maple. Once the bacon was ready in it went to the eggs, with a little cheese, salt, and pepper for a little bit of a mix, into the pastry, into the oven, 30minutes later done! The flavour of the maple bacon did definitely make a difference to the pie, in that it was sweeter which I put down to the maple syrup used? The whole family enjoyed it. With the remaining 2 slices, I decided to cook up some scrambled eggs and bacon to have on toast. Keeping the rashers whole I fried them in a frypan just as is with no oil, the smell as it cooked was divine, slightly sweet and I was interested to see the bacon was a slightly different colour than my bacon usually looks. The bacon cooked well, and tasted great with just the right touch of sweetness, I loved that the bacon was not at all chewy. As far as quality bacon goes, this is one of the better ones I&apos;ve tried, I loved the slight sweetness to it and the way it fried, I would certainly buy this again especially if I saw it on special. As a family, we eat bacon quite often and this bacon sounded like it would be a bit different. I decided to cook this in a bacon and egg pie. I cut off the main part of the bacon fat as I don&apos;t eat fat and mixed in some eggs and some mushroom to try and make this pie a bit more filling as I was feeding six people. The bacon was easy to cut and separate the fat off, lucky there wasn&apos;t a lot of fat. We noticed that the kitchen started smelling really nice around half an hour after putting the pie in the oven. Everyone was impressed with the bacon, I heard comments that ranged from "yummy" to "we have to get this again" and even my son who is not that big a fan of eggs (he usually avoids eggs like they would poison him) liked the pie. Decent bacon does cost rather a lot so I would be buying this again but not all that often. Someone once said that the higher the content of pork the better the bacon and this bacon is 84% pork. I also liked that they state that the pigs are looked after. Bacon is a meat we use in our house quite often. We are busy working parents and with working late or having after work activities going on we can easily have 2 meals of bacon and eggs for dinner a week alone and on top of that we&apos;ll have bacon and eggs on the weekend for breakfast sometimes too. Bacon is one of those foods that goes with pretty much everything and because of this it&apos;s something we have a lot of stored in the freezer for when we need it. I&apos;ve found middle bacon to be the most used in our house because of a combination of the price, flavour and amount of fat on it (we like a bit but not too much). 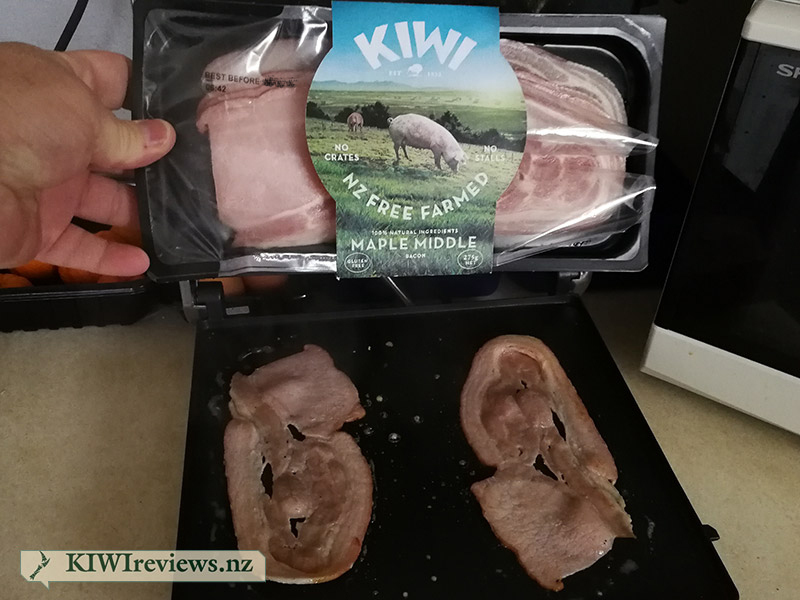 I was pretty excited to try Kiwi Bacon&apos;s Maple Middle because it sounded delicious and with how much bacon we usually eat I thought I&apos;d be a good person to see how it stacks up against other brands we&apos;ve tried. 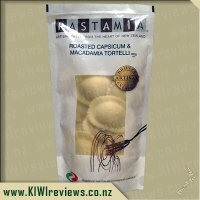 The packaging is nice and plain and there is no doubt about it being a Kiwi product. 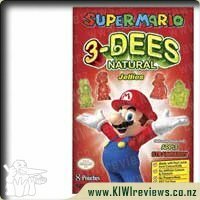 Like similar brands you can see exactly what you are getting through the clear plastic which is always useful. We cooked it the same way we cook our usual bacon - frying. It was very easy to fry and we found it didn&apos;t stick to the bottom as much as our usual which was nice when it came time to wash the pan. The taste was delicious, there was a definite hint of a sweet maple flavour which really put it a notch above other brands I&apos;ve tried. 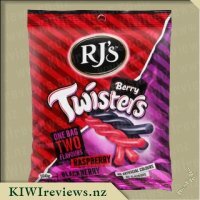 The price is the only thing that would probably make me stop and think if it was really worth the extra expense considering how much I usually buy in a week (on a normal week I&apos;d buy 4 packets). We are trying to keep our shopping costs down as much as possible and at $8 for 275g it seems a little steep for us. 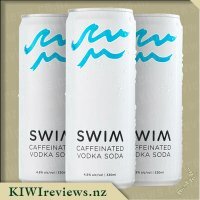 Although, when we are having a little splurge week this is a product I would definitely like to purchase again considering how good it tasted. Middle Bacon is not my usual choice for bacon cuts. While it has less fat than other cuts, it has more than others and I have been working hard to reduce the amount of animal fat I eat. Thus, I wanted to find a way to cook bacon that didn&apos;t require extra fats to be added... and since my non-stick frying pans are no longer non-stick, it fell to my MacGyver mind to come up with a solution. Looking in my kitchen cupboards, I spotted my sandwich press. Non-stick, heat from top and bottom, would keep the bacon flat... BINGO! After making the sandwich, there was a fair bit of bacon fat left on the platter, so I decided to waste not want not... and slapped the sandwich down, flipped it a few times to ensure an even spread of the bacon grease on the bread, then dropped the lid to let it toast. Yep, OK, now it&apos;s even better! Overall, I would happily buy this again, but it would only be as a treat food... which may help me reduce my meat intake down even more. I can&apos;t really fault it, and the price is fair for what you get, if you value quality over price. 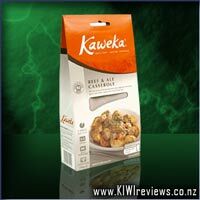 Product reviews for listing 976: Kaweka - Beef & Ale Casserole - Brand : The Kaweka Food Co.
Bite-size pieces of tender beef and choice vegetables simmered gently with herbs & spices and micro-brewed ale. Our Beef & Ale Casserole is a traditional favourite containing tender, bite-size pieces of prime beef and choice vegetables, simmered in a smooth gravy with herbs & spices and micro-brewed ale.